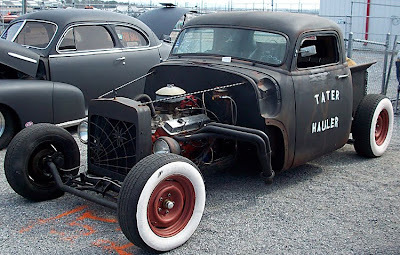 You don’t need a fat bankroll to build or buy a standout Rat Rod. 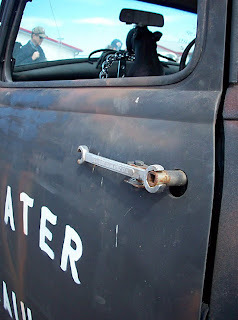 The $5,500 entry price into Rat Rod stardom seemed like a small price to pay for the carefully crafted patina on this 1954 Chevrolet. 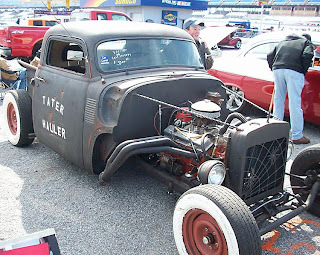 The truck was built by Boaz, Alabama’s Billy Sampson and up for grabs in the car corral at the 2010 Alabama Antique & Classic Car Auction, Car Corral & Swap Meet at Talladega Superspeedway. 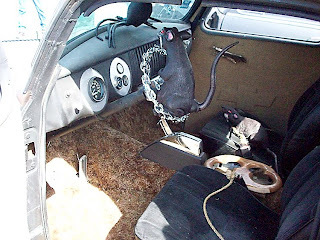 Sampson’s custom Chevy drew as many stares as the $200,000, 1966 Corvette Sting Ray also parked in the car corral. 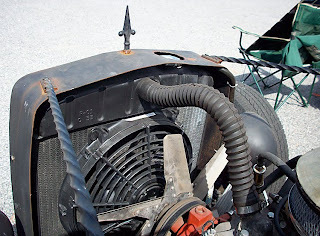 Sampson started with the cab of an early-1954 Chevrolet pick-up truck plus an off the shelf dropped tube front axle kit. 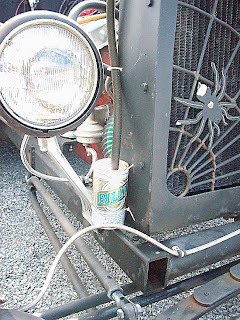 He welded a square tube frame together and cut it to where it felt right. “I just looked at it and decided where I wanted the rear wheel to be,” Sampson said. 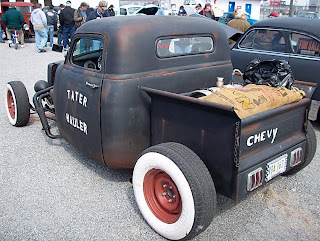 “Then I cut the end of the frame off there.” The super short truck box has enough room for a sack of ‘fake’ taters and the fuel tank. Disc brakes at all corners create a measure of safety for the bumperless beast. A 350 cubic-inch Chevrolet engine backed by a Turbo 350 automatic transmission keep things moving. 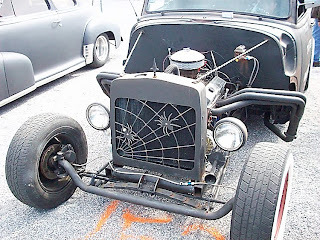 A four-link rear suspension kit sits between the wide white wall tires. 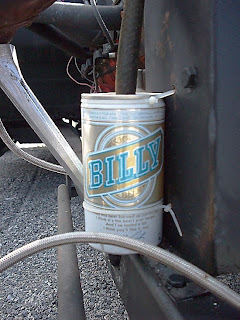 A vintage 1955 Chevrolet radiator stamped with the year 1955 keeps the engine cool, while a Billy Beer can catches the overflow. 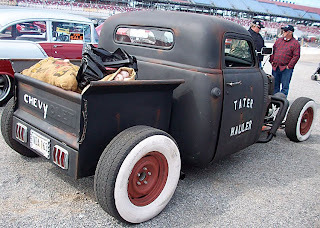 Junkyard parts and a pile of imagination will get you on the road to earning your Rat Rod merit badge. 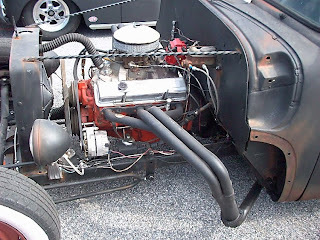 Sampson built his ’54 in about a year. Send him an email if you want to save time and buy this one. 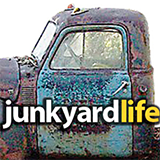 Send your stories and photos to junkyardlife. Looks like rust. 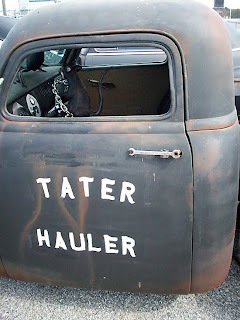 No, just brown paint for authenticity. 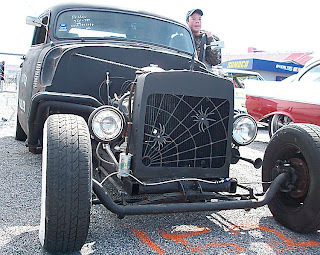 See another homebuilt hot rod here. 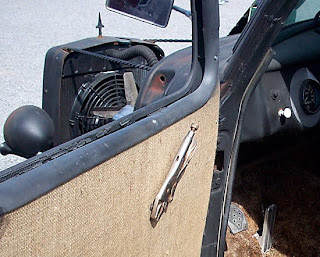 1955 Bel Air Nomad: Authentic or faux patina? Junkyard find: Magster wheel, Halibrand worthy?